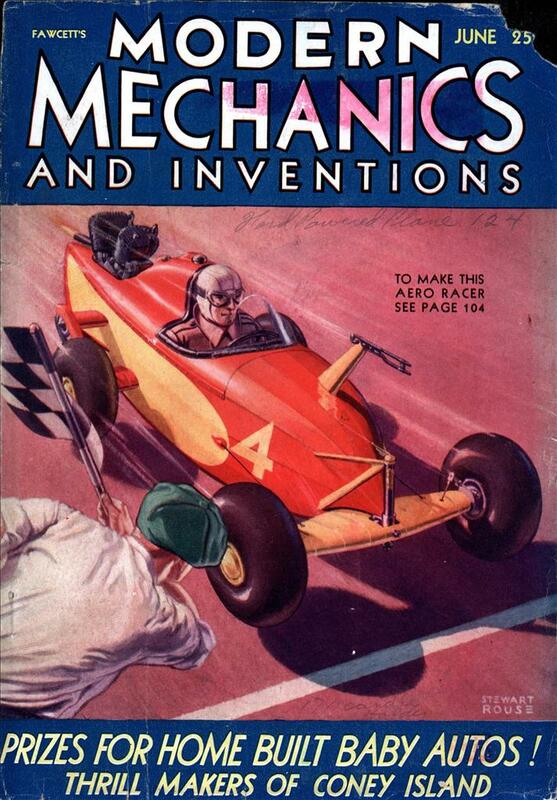 More amazing than the rocket car is how it makes stippled clouds. 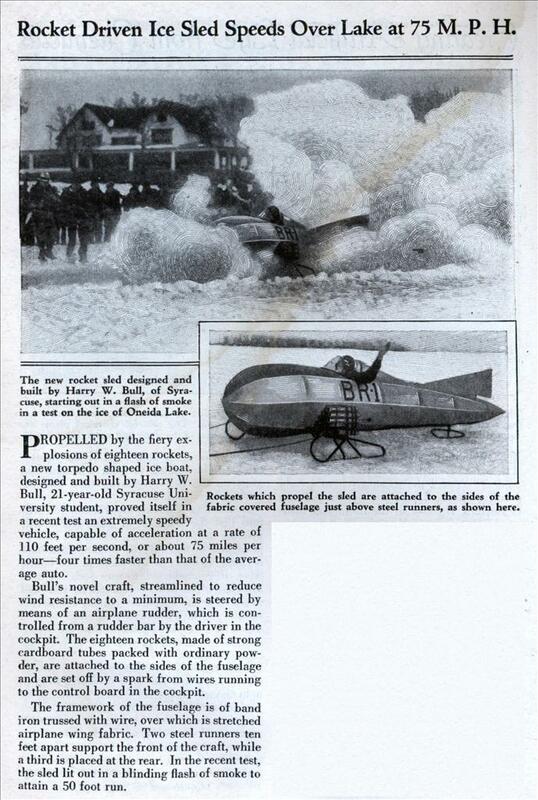 Rocket Driven Ice Sled Speeds Over Lake at 75 M. P. H.
PROPELLED by the fiery explosions of eighteen rockets, a new torpedo shaped ice boat, designed and built by Harry W. Bull, 21-year-old Syracuse University student, proved itself in a recent test an extremely speedy vehicle, capable of acceleration at a rate of 110 feet per second, or about 75 miles per hour—four times faster than that of the average auto. Bull’s novel craft, streamlined to reduce wind resistance to a minimum, is steered by means of an airplane rudder, which is controlled from a rudder bar by the driver in the cockpit. The eighteen rockets, made of strong cardboard tubes packed with ordinary powder, are attached to the sides of the fuselage and are set off by a spark from wires running to the control board in the cockpit. The framework of the fuselage is of band iron trussed with wire, over which is stretched airplane wing fabric. Two steel runners ten feet apart support the front of the craft, while a third is placed at the rear. In the recent test, the sled lit out in a blinding flash of smoke to attain a 50 foot run. I blew out the engine in my snowmobile– can I replace it with a rocket? Apparently the rockets will only get you about 50ft. If the acceleration doesn’t get you the deceleration will. I wonder how they measured the speed. Easy way is by putting two wires at a know distance from each other and measuring how long it took to break the 2nd wire after breaking the first. The clock would start when the first wire broke and stop when the second wire broke. They’d been using that technique for decades at that point.